I have commented at length and repeatedly about the misunderstand and misappropriation of science for various reasons. And I think it is a legitimate worry as it can have repercussions for science as a whole and for the people who would use science to make their decisions. (and that goes for politicians and policy makers as well as people trying to work out if their new car really is fuel efficient or whatever). Science matter and therefore understanding science matters. You might have seen this doing the rounds and it’s quite horrifying. Ok, so it’s obviously a scam site of some kind designed to fleece you of a few bucks, but I also find it genuinely disturbing. Whoever set it up was, I stongly suspect, an idiot (or quite possibly, a genius for realising that people would fall for this, what test could be easier to pass for msot people?). 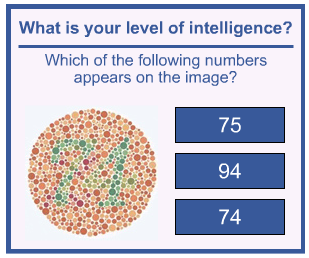 This is a test for colourblindness, not for IQ. And people are falling for this. Which rather implies that the scientific understanding of a great many people of something that is incredibly basic (since many people have taken IQ teats of some form or another and had their eyes tested for colour perception problems. How can you confuse the two? Even if you don’t know what these are, or how they are supposed to work, it should take seconds to work out or seconds to look up. If you don’t know, and can’t or won’t work it out, I’d be worried to leave you alone in a room with any sharp objects nearby. If this level of deception is all that is required to fool people about how science works then I despair at how we are supposed to communicate our work, or its importance, significane, or what it really means to a real lay audience. No wonder pseudoscience and non-science are so prevalent. Last year Andy Farke and I launched the ‘Palaeo Paper Challenge’ over on his blog. The basic idea was that we, in common with everyone we know, have at least one paper lying around that we never quite finished and never got submitted. The one that was certainly worthy of publication, but never high priority enough to fianlly finish when other things needed doing. We wanted to encourage ourselves and friends to get moving and get these papers finished and submitted. It worked quite well with several papers making the light of day that might otherwise have been held up another year or decade. So this year, we are brining it back, but bigger than before. See, the *paper* challenge really only works if you are writing science papers on palaeo topics, so this time out we are calling it the Palaeo Project Challenge and encouraging all and sundry to join in. Are you a preparator with a specimen that needs a casting, a curator with a box of material that needs rehousing, an artist with an image or sculpture to finish, an educator who has been menaing to take the class to the local museum, a blogger with a big post that never saw the light of the monitor, or a student with a thesis chapter than needs doing? Any and all of these we want to include in the new bigger PPC. Anything palaeo related counts, so if you need a bit of motivation then sign up. There’s no real obligation of course, but saying you are going to do it in public and discussing your ideas and progress with others should help you along. So head over to Andy’s patch and sign up. See you there. OK, so you have probably seen this already. But if not, dive into this fantastically accurate parody of science reporting. And for once, do check out the comments too. Nice to see people get into the swing of things so effortlessly and so completely. What a shame it is so accurate. 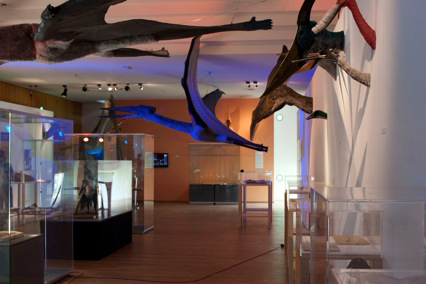 Regualr readers will know all about the great pterosaur exhibit of London as set up by Mark Witton, Darren Naish and others. 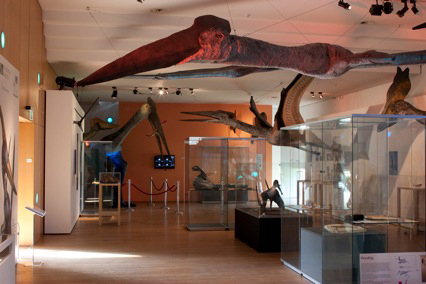 Well, now it has moved on and is currently on display in the Netherlands courtesy of pterosaur researcher Andre Veldmeijer. You can see a short news report (and video) of the exhibit in Rotterdam here and Andre has also sent on some photos of the exhibit (photos property of Adri ‘t Hooft Photographic Services) which are included here.. 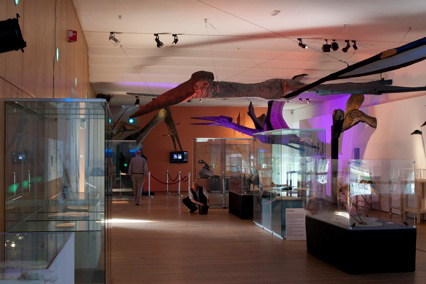 In addition to the models and graphics from the London exhibit, the museum has also collected together a bunch of original pterosaur specimens from around Europe fopr the exhibit, so even those who made it to the brief stint on the South Bank might find the trip worthwhile. The guys over at ART Evolved (there for all your palaeoart needs) have come up with the rather nice idea of using pink dinosaurs to generate money for breast cancer research. So drop on over there or indeed here (http://cancerevents.kintera.org/pinkdinosaurs) to join in. Since I’m not Darren Naish, I have trouble keeping up with every damned tetrapod on Earth. Compared to many of my colleagues however, I do have a great range of research interests so I’m stuck with trying to keep track of various archosaurs, pterosaurs and dinosaurs and the odd basal bird. 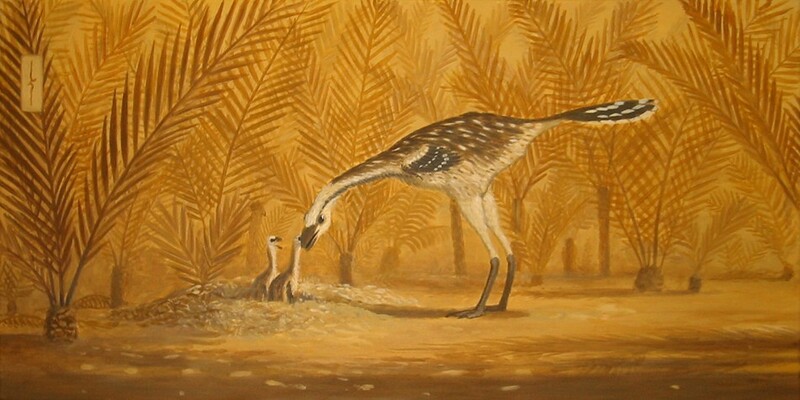 Frankly, it’s hard enough keeping up with all the pterosaurs these days (not least becuase of the huge range of journals out there now, and the rate at which things are discovered, as well as the raw numbers). Among all this, I must confess that I spend most of my ‘catching up’ time on dinosaurs with the theropods, then sauropods and then the ornithischians and prosauropods generally come a distant third. However, even I’m aware of just how many ceratopsians have appeared in the last few months and now there are two more! Thanks to Scott Sampson, Andy Farke and others we can say hello to Utahceratops and Kosmoceratops. Their paper (in PloS One, so freely available too) however deals with much more than just a couple of new genera (despite their importance and interest in their own right). In it they argue that some of the ceratopsians from the Late Cretaceous of North America were geographically separated from one another within the continent such that the northern part held a different fauna to that in the south. The authors themselves will be blogging about their work and the paper is out there so no need for me to say much more than ‘well done’ and to encourage you to go and read it. I said it would be a badger next. Nope, this time it was a cow. Really. Still, at least they thought it was something mammalian rather than a river spirit. Who knew? People who doubt the science of climate change, also seem attracted to the idea that evolution is just a conspiracy (it’s the evolution ninjas at work) and alos have psychic powers and have discovered lost cities. Hmmm. Still, kudos to the Grauniad for writing this up and challenging these people in public. Proof, if it were needed, that the Pterosaur.net team do actually work on pterosaurs and not just blab endlessly about them comes from todays new paper featureing Ross Elgin, myself and Dino Frey. Once more, this is an odd time to talk about it since what has actually turned up are the uncorrected proofs, but it is out there and being read, so now is the time to talk about it. (You can download and read it here, and a very old post of mine here might be a good primer if you don’t know your pterosaur wings too well). I’ve been knocking around the idea of this post for a while and was never quite sure if it was entirely appropriate, but I think it’s OK. I hesitated becuase I didn’t want to be jumping someone’s work, but not only do I not think I am (i.e. I don’t know of people working on this) but more importantly, what I’m really doing is reproducing and spreading something that is already out there. Anyway, enough with the fluffy preamble, the point is that certain people on the internet decided long ago that Tinayulong (that ornithischian covered in elongate fibers of some form or another) was probably a fake. Either the plumes were added on or tail was from a dromaeosaur or whatever. No matter that the people working on this material had endless experience of dinosaurs from Liaoning, included experts in both dromaeosaurs and ornithischians, and they had been involved in uncovering the Archaeoraptor mess. Nope, this was a fake, or an error, or something. If that wasthe case, then people have been really busy beacuse there are more specimens out there. I’ve known about this for ages and even seen the material in question, but it seemed inappropriate to talk about as long as this was behind closed doors. 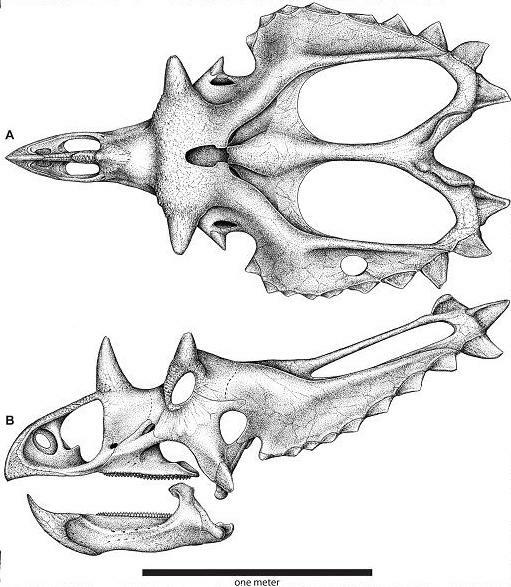 However, a recent edition of a Chinese magazine included photos of a specimen that was not the holotype. Since this is already out there in the public sphere (if in a fairly obscure location) I don’t think I’m interfering with ongoing research by letting it be known. Tianyulong is a lot of things, not least it’s ‘annoying’ in muddying the previously clear waters of feather evolution (just like the recent Concavenator) but it’s not a fake or forgery or accident. Multiple specimens really help clear up doubts like this since aside from the thing not looking like a fake and being consistent with being a single, coherent specimen, the idea that multiple different people could fake multiple different specimens from independent sources and get the exact same anatomy and structre there is highly implausible at best. Ok, poor joke, but this is a quick attack on the media (who knew?). Thanks to some helpful backlinking I found this story on Science Buzz. Basically it reports on bad science reporting and how it could be done better, with commentary from Brian Switek and a nice link to one of my essays on here about how reporters could make dinosaurs stories more accurate. Great you may think. Not only have the media actually chosen to report on how badly the media can be at reporting on things, but have even suggested that readers and journos alike should brush up on how this all works and where they can go wrong. Cool. Only then I found this, published just a couple of months later by the same writer and, wouldn’t you know it, utterly failing to take heed of things I had said, and he had suggest people read and advised people to follow. Why bother? I mean, really. When they even read it and know about it and tell others to do it and STILL don’t do it themselves, why bother. Note: normally I do add comments to such stories to highlight these errors directly to the person concerned. For once I didn’t, partly becuase I’m frustrated, partly becuase it never seems to make any difference at all, and in this case becuase it’s also quite a bit late in the day for an article from June.